the fash pack: krispy kreme, baby! 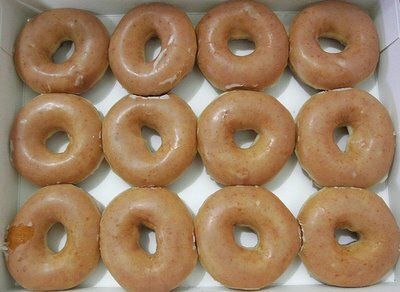 Wow, gone are the days when you asked Krispy Kreme as pasalubong from America, and some folks actually hand-carried them home! Also remembered the first time I had Krispy Kreme. When I ordered a glazed and a hot chocolate, the hot Latin mama who took my order made an "eww, you freak" face at me. Jenny Martinez explained that it was because I ordered "sweet" with "sweet"
So, how does thefashpack take its Krispy Kreme? I feel so left out, some of my friends have already had Krispy Kremes given out to their offices, or they just got KKs somewhere even if it's not yet open because of all those free stuff they give away to create some pre-launching buzz, and then I saw on TV the other day something like a press launch of KK with celebs. Darn, I wish I also had a Krispy Kreme "miracle" like you guys, but since I'm not one of the lucky ones who's able to get KKs pre-opening, I'd have to brave the lines at KK tomorrow. P.S. Krispy Kreme's location has been renamed from City Center to "Bonifacio High Street", which also has the same launching day as KK. It will be somewhat an extension of Serendra... looking forward to seeing the stores opening there.